The compact Sonora uses its Intel Atom CE5300 Processor for H.264 compression, offering Baseline, Main, and High profiles. Audio features include MPEG-4 AAC-LC encoding, 48 kHz sampling, and MPEG-1 Layer II and MPEG-2/MPEG-4 AAC audio decoding. The Sonora can encode video at rates up to 1080p60, with video bit rates going as high as 20 Mbps, or as low as 250 kbps for delivery over bandwidth-constrained networks. Link this encoder/decoder to your network via its RJ45 10/100/1000 Ethernet port. 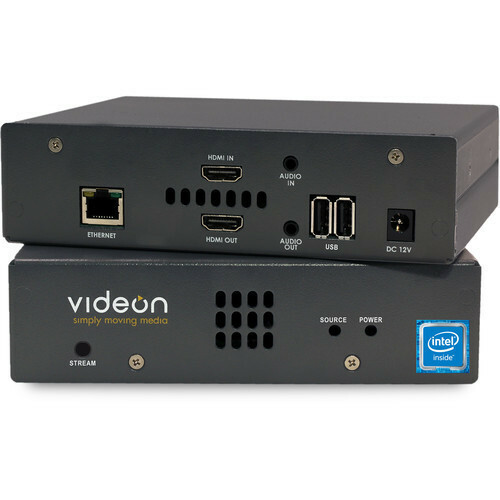 Network and control features of the Sonora include a web-based UI (user interface), integration with third-party controllers and applications, HTTP command and control, and auto-detection of other Videon units on your subnet.